You know you should exercise, but you’re busy, or it’s too cold or too hot, or you just don’t like working out. How much of a problem can not exercising regularly really be? A very big problem, more and more studies are finding. One recent study found that people who sit for more than 11 hours a day had a 40 percent higher risk of death from all causes. A Harvard study linked watching TV for two hours per day with a 20 percent increase in type 2 diabetes risk and a 15 percent increase in heart disease risk. Being sedentary has also been linked by researchers with an increased risk of colon and breast cancer. So what should you do to protect your health? Jordan Metzl, MD, a well-known sports medicine physician at Hospital for Special Surgery in NYC and author of several books on exercise and health, has a straightforward answer. Exercise is health. It’s an effective, safe tool for the prevention and treatment of a very wide range of health problems. 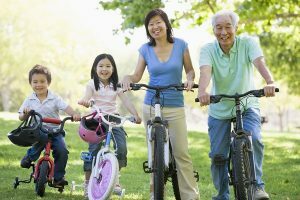 In fact, studies have found that regular moderate exercise like biking, swimming, and walking can add years to your life. Lack of exercise, in contrast, is a greater risk factor for death than smoking, high blood pressure, obesity, or high cholesterol. Watch this free webinar with Dr. Jordan Metzl to learn more about why you should take part in regular exercise, how it effects your overall health and wellbeing, and about exercise options that will work for you, no matter how fit (or unfit) you are today.